Lake Tahoe is one of America's most pristine, beautiful alpine Lakes. Nestled in the Sierra Nevada Mountains at 6,229 feet above sea level, the lake is renowned for its crystal clear water and scenic splendor. Surrounded by the Eldorado, Toiyabe, and Tahoe National Forests, Lake Tahoe is one of the deepest lakes in North America -- 1,645 feet deep and covering 193 square miles. Currently supporting nearly 250,000 people, the watershed at Lake Tahoe provides nearly 85 percent of the water for northern Nevada and the Truckee-Donner area. Lake Tahoe has also become an important symbol for issues dealing with land and water use, resource management, urban growth, and landscape perception. Clearly abused during the nineteenth century, Lake Tahoe has made a dramatic return to the scenic designation it deserves. Yet as the second-growth forests mature, new problems are challenging the Tahoe basin's identity. Lake Tahoe is now threatened by urban sewage and motorized boat traffic. Dramatically over-harvested, Lake Tahoe's fish population has yet to return to its pre-settlement abundance. Ever-increasing demands on building confront the fragile eco-system. The hillsides are subject to increasing erosion, sending greater amounts of effluent into the lake. 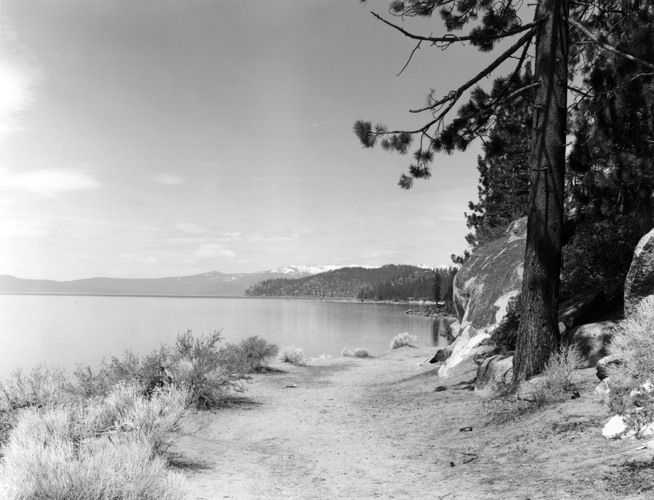 Using photographs from a variety of national and local archives, Stopping Time offers comparative views of historical and contemporary photographs, providing a visual document of the evolving landscape within the Tahoe Basin. All of the captions for the Stopping Time exhibit were written by C. Elizabeth Raymond. Stopping Time: A Rephotographic Survey of Lake Tahoe. Goin, Peter, essays by Elizabeth Raymond and Robert E. Blesse. (Albuquerque: University of New Mexico Press, 1992). Glenbrook, Lake Tahoe. The effects of lumbering were dramatically visible in the summer of 1884, when this picture was taken. The debris from the logging and milling activity created an artificial shoreline at Glenbrook Bay, as tons of sawdust were deposited along the lakeshore. Clear cutting of trees on mountain slopes accelerated water runoff into the lake. The photograph at top left suggests the truth of one story, that after the Glenbrook area was logged, "only eleven trees were standing as far as the eye could see." The modern shoreline of Lake Tahoe is also an artificial creation, made possible by the new dam at the outlet to the Truckee River. The dam was completed in 1913, to store water in the lake for downstream users. The maximum storage allowed raised the lake level six feet beyond its "natural" outlet of 6223 feet above sea level. Seasonal variation in lake level occurred even before water began to be stored there, however, due to natural cycles of drought affecting the mountain streams that drain into Tahoe. The impact of Lake Tahoe lumbering is also evident in this 1882 view of the famous cable tramway owned by the Sierra Nevada Wood and Lumber Company at Incline Village. 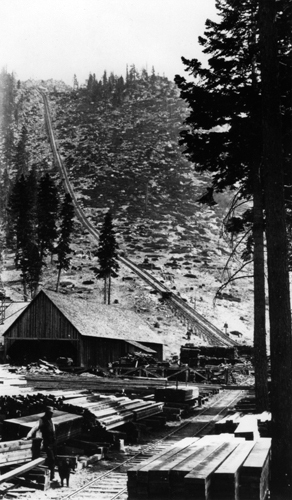 Completed in 1880, the incline took lumber from the mill area in the foreground to a flume at the summit, where it made the downhill trip on its way to the Virginia City mines. 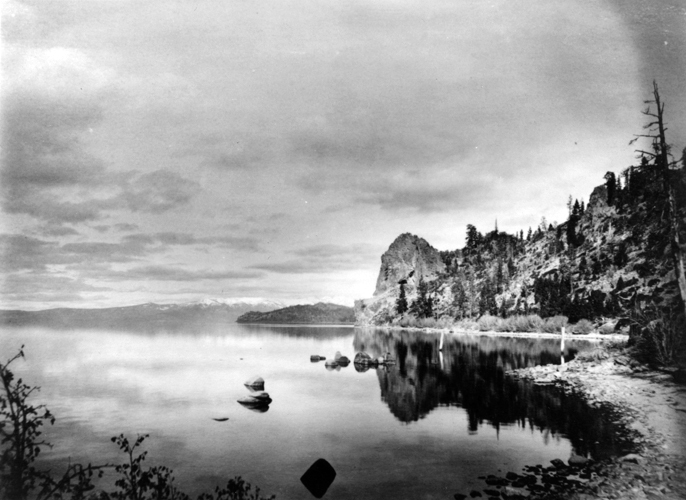 This image and the one following span more than a century, revealing the full extent of the transformation from the nineteenth-century industrial landscape to an ostensibly "natural" modern Tahoe. The historical photograph is a view toward the southeast. It depicts the summit camp of the Carson and Tahoe Lumber and Fluming Company. At this point wood was transferred from the narrow-gauge railroad that brought it up from the lakeside mills at Glenbrook to the flume that would float it down the eastern slope of the mountains to Carson City. Flumes are clearly visible in the left foreground. Loaded cars of cordwood and engines are on the sidings in front of the summit camp buildings. All of the surrounding land has been clear cut. 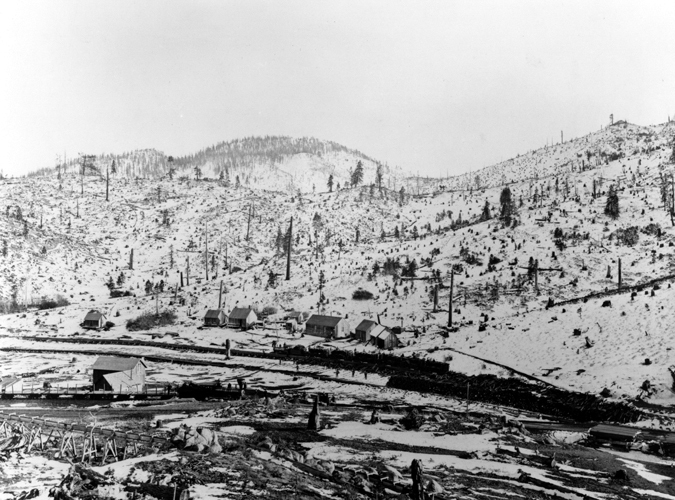 Spooner Station lumber camp was defunct by the turn of the century, when logging at Tahoe declined. 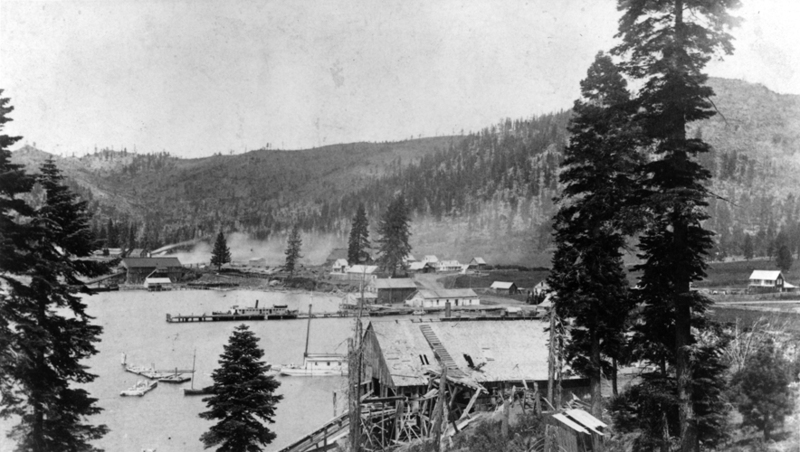 The railroad was removed and relocated to Tahoe City. 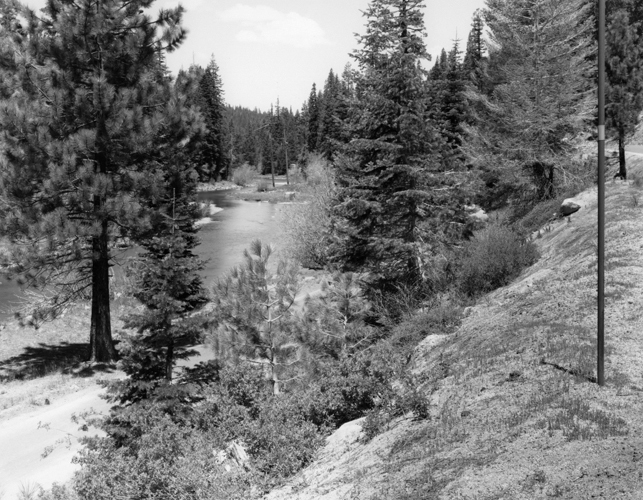 In this 1992 photograph, the former camp has been designated by the U.S. Forest Service as a picnic and rest area, a place to enjoy the ambience of Tahoe. The second growth forest, interspersed with aspen, gives little indication of the intensive activity that once took place there. The area is still a major transportation route, however, and Highway 50 is clearly visible. 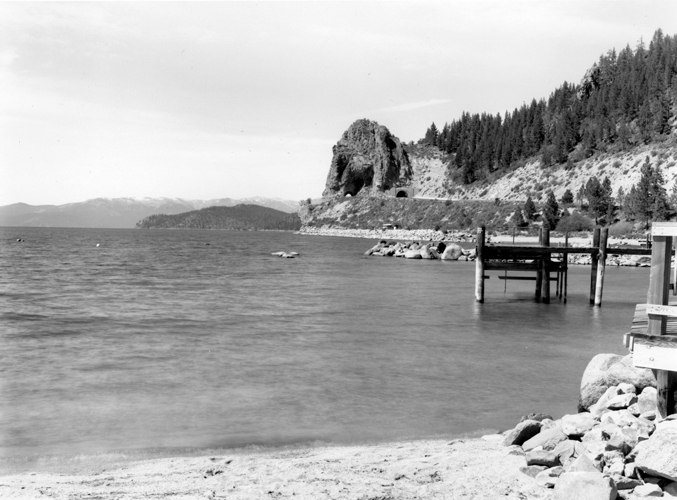 Cave Rock was always an important navigation point for Lake Tahoe travelers, because it was visible from many points. It was a major obstacle to travel around the lake, however. Early travelers followed a Washoe trail that went up and around the hill. The 1862 toll road to Carson City circled to the west of the rock on a 100-foot trestle bridge complete with hand-chiseled stone buttresses. The original cave that gave the site its name is clearly visible in the image. 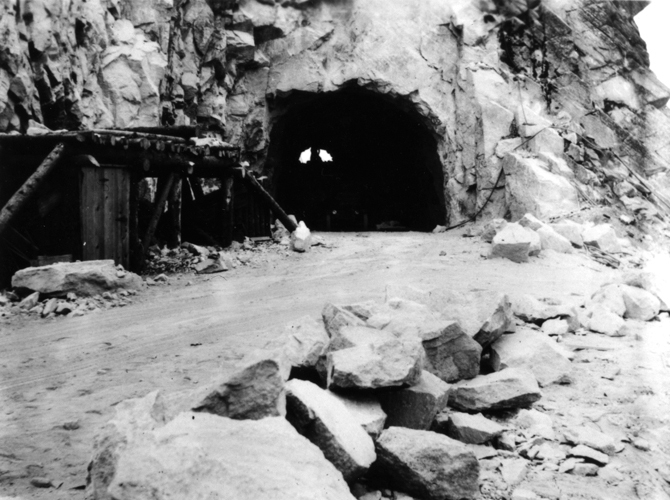 The original cave which gave Cave Rock its name was destroyed when tunnels were blasted for the present roadway. 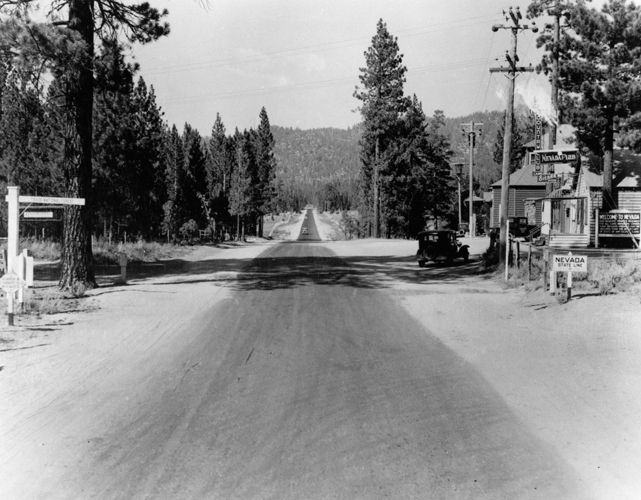 The first tunnel (presently westbound Highway 50) was constructed in 1931. Cave Rock, Lake Tahoe. 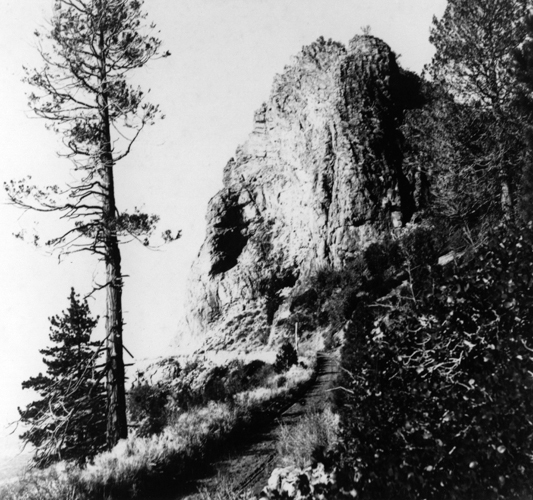 This historical view is looking north towards Cave Rock. This view is looking north at Cave Rock and its two modern Highway 50 roadway tunnels. Note the second-growth forest visible on the slope above the rock and the marked impact of the road on the landscape. 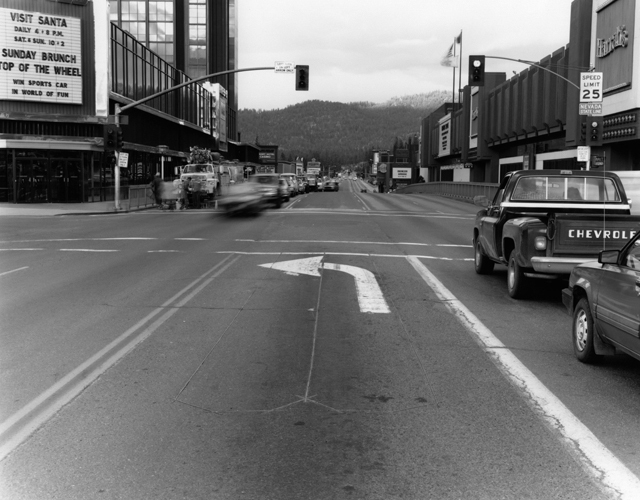 Modern highways that can be kept open in the winter are integral to Lake Tahoe's survival as a year-round resort. 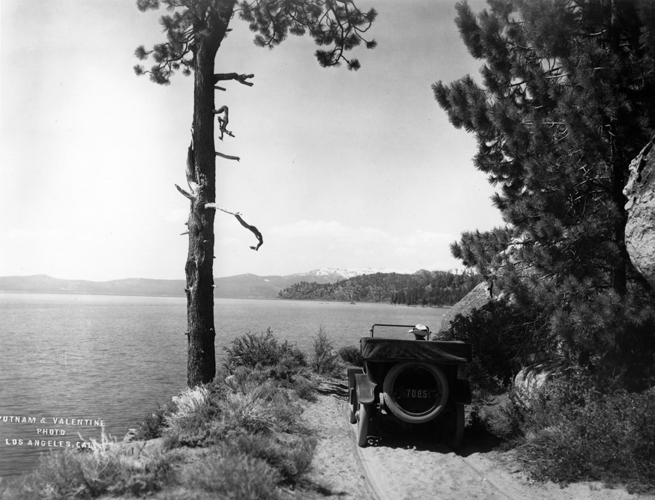 This car and woman appear in a series of documentary photographs taken around Lake Tahoe by C. O. Valentine early in the twentieth century. It was unusual for operators, as photographers were called in the nineteenth century, purposely to record the backs of people. In the historical photograph, which was taken in July 1908, the personality of the woman clearly was not intended for visual consumption. Her presence was useful to indicate scale, emphasizing the documentary nature of the photograph. 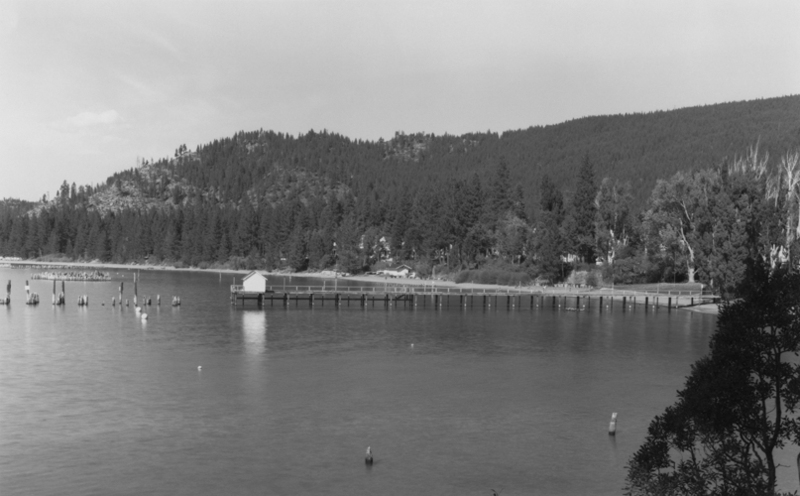 Although this old road at Lake Tahoe appears quite rustic in the modern rephotograph, and is no longer in active use, expensive vacation homes (cabins) are now located at its end, just behind the vantage point. Deadman Point is visible in this view to the north. Stateline, Nevada. 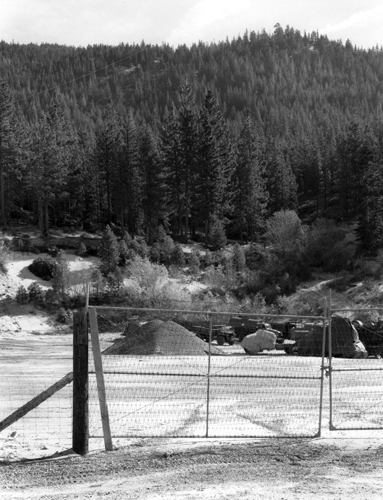 This image and the one following provide striking testimony to the impact of legalized gambling on the Tahoe landscape. 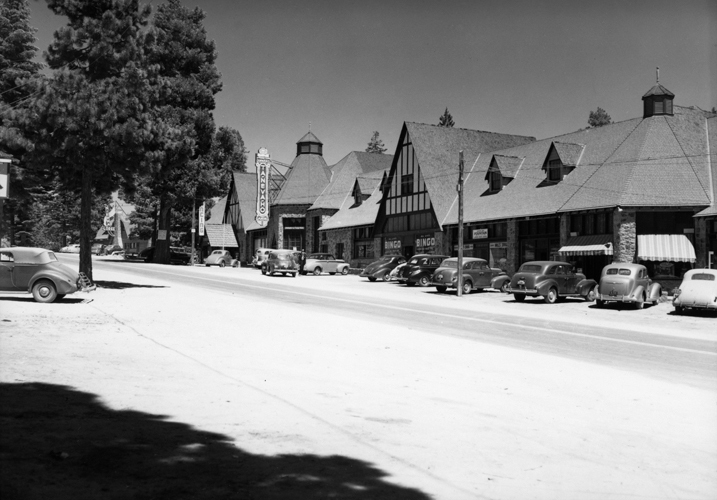 The Nevada Club, located at Lake Tahoe's southern state line, was a renowned gambling club in the 1920s, but it was not a year round operation, and the community was small. Nevada legalized gambling in 1931, and improved winter transportation into the basin after World War II had obvious consequences. Stateline, Nevada. The settlement at the lake's south shore, which includes South Lake Tahoe, California, and adjoining Stateline, is presently the largest community at Tahoe. 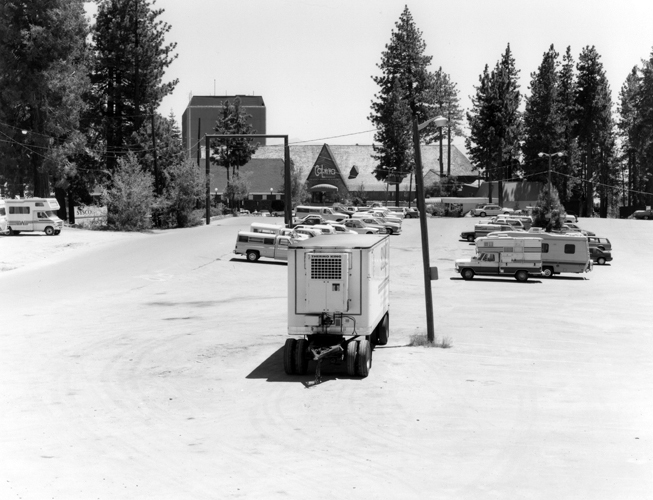 In the words of environmental historians W. Turrentine Jackson and Donald J. Pisani, the casinos at Tahoe are a "preeminent symbol of the selling of the environment." Harvey's Wagon Wheel Hotel and Casino, on the left in this photograph from the 1990s, and Harrah's Tahoe on the right are both high-rise hotels as well as casinos. Crystal Bay, Lake Tahoe. 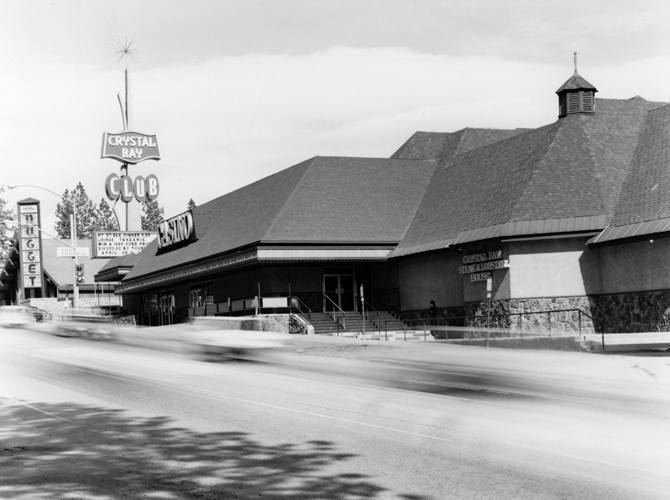 The Ta-Ne-Va-Ho, abridged from Tahoe and Nevada, has become the Crystal Bay Club and Casino. Crystal Bay, Lake Tahoe. Located on Lake Tahoe's north boundary between Nevada and California, the Crystal Bay Club and Casino reflects its architectural heritage. The old roofline and cupola have been incorporated into the expanded modern structure. Crystal Bay, Lake Tahoe. The evolution of the parking lot at the Cal-Neva Lodge reflects an increasing concern for the utilization of space and accommodation of automobiles over the preservation of a natural environment. The state boundary runs through the middle of the Cal-Neva Lodge, which was originally built in the 1920s by Robert Sherman of San Francisco. Crystal Bay, Lake Tahoe. In 1930, after its sale to notorious Reno underworld figures James McKay and William Graham, it was operated as a night club and casino. The original lodge burned and was rebuilt in 1937. Crystal Bay, Lake Tahoe. 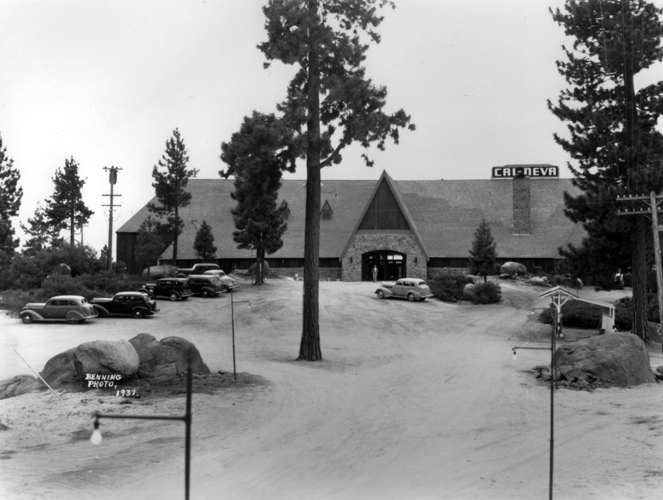 In the early 1960s the Cal-Neva Lodge was owned by Frank Sinatra. This more contemporary view was taken from a raised area next to highway 28. Truckee River Canyon. 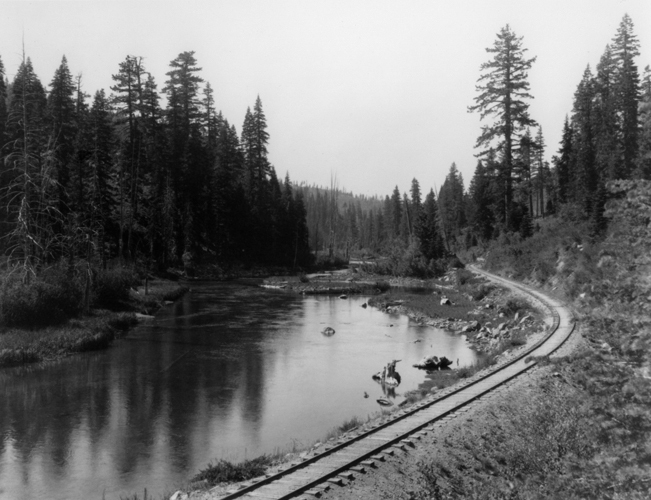 This route--from the railroad at Truckee, California, to the lake at Tahoe City--was the customary approach for tourists before automobiles were common. Early visitors made the trip in wagons, carriages, or on horseback. 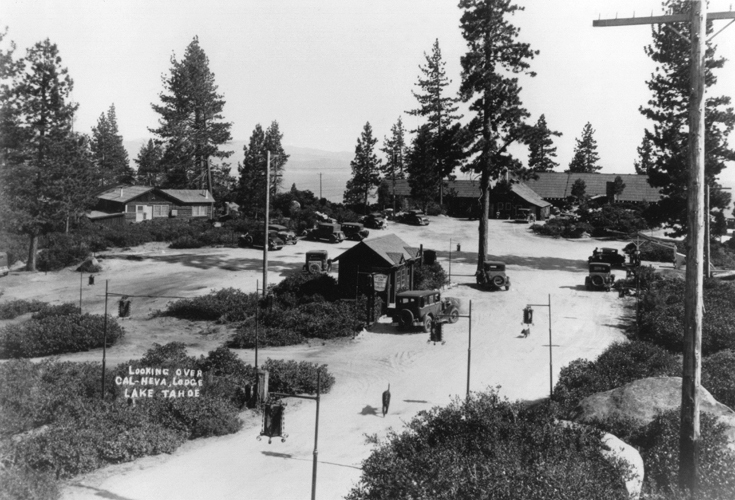 The railroad in the historical photograph was built by the Bliss family of the Carson and Tahoe Lumber and Fluming Company, to serve their new resort at Tahoe City, the Tahoe Tavern. It began operation in 1900, and was scrapped during World War II. Truckee River Canyon. In this contemporary photograph, the old railroad in the Truckee River Canyon has been replaced with a bicycle path and the growth nearly obscures the horizon. 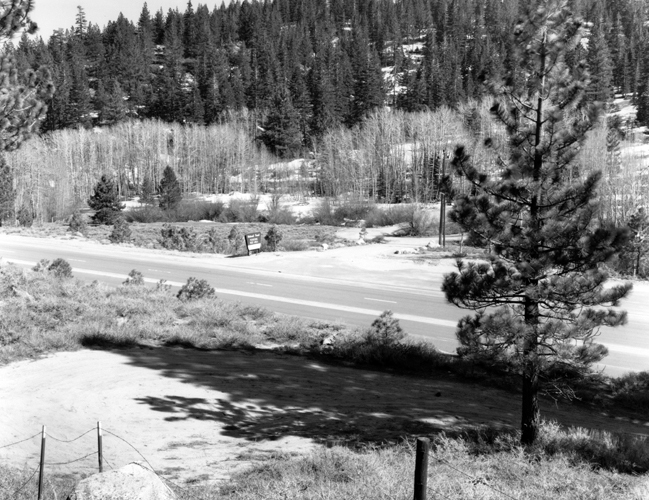 This site is located approximately one fourth mile before the "National Forest Lands, Lake Tahoe Basin" sign on Highway 89, just past the Alpine Meadows Ski Area and the River Ranch Resort. The overgrowth, lack of landmarks, and minimal horizon made this one of the most difficult sites to find and rephotograph.